It’s a busy world and it seems we are always preparing for something. Here at Rainier, our field crews are finishing up the last of the late harvest and preparing for fall and winter orchard work. And with the apple season in full swing, the packing crew and sales staff are busy filling orders and getting them out the door. It seems we’re always busy, which makes taking time for health and wellness, hanging out with friends….and a having a little fun so important. And what’s more fun than a fall Turkey Trot. Thanksgiving is just a few weeks away, which means soon Turkey Trots will be happening all over the country. Don’t hesitate – sign up. Most of the time, it also includes a good cause like donations for your local food bank. We thought what better way to get prepared than to ask our resident running ambassador, Laura from This Runner’s Recipes for some tips on getting out the door. Whether you want to run your first race or are looking for a fun way to exercise before the feast, a Turkey Trot can add some healthy fun to your holiday celebrations. These tips will help you prepare for your Turkey Trot race, especially if you are a new runner or participating in your first race. You can run or walk…but you should be prepared. If you do not run regularly, you want to spend a few weeks preparing for the race. Building up your endurance will help you enjoy the race and acclimating your muscles and joints will mean that you feel good after the race, rather than being sore and achy during the Thanksgiving feast. If you do not run at all, start with 20-30 minutes of run/walk intervals. Run for 30-60 seconds and walk for 1-2 minutes. Aim to run three nonconsecutive days each week. Over the course of several weeks, build up your run interval distance so that you are running for longer than you are walking. If you are able to run three miles, try increasing your distance to four or six miles before race day. You will feel more comfortable and confident at the 5K distance on race day knowing that the distance won’t pose a challenge for you. BUT – if you don’t want to run, that’s OK to. Walking is just fine and a great way to get your metabolism going before you eat all that turkey and apple pie. Don’t let the adrenaline of racing or the excitement of the crowd cause you to start your race too fast. 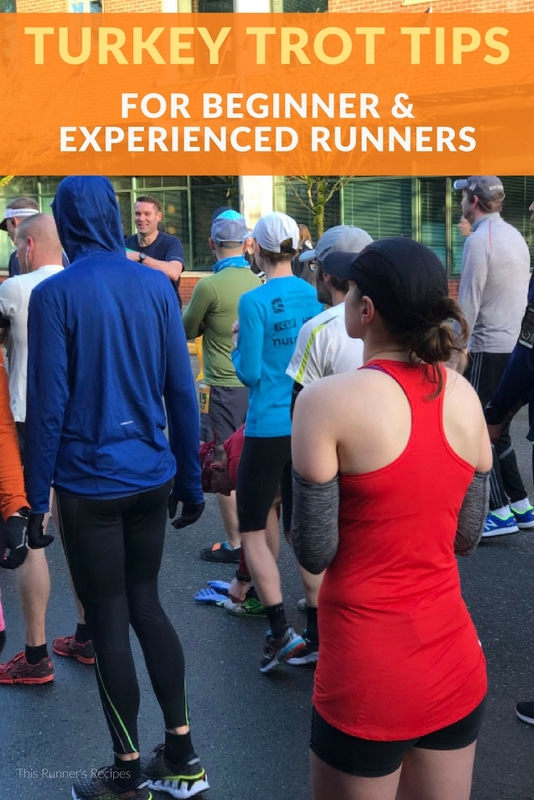 Even if you are comfortable running 3 or 6 miles, you can still have a tough race experience if you start out too fast. If you are a new runner, aim to run at the same effort you do on your normal runs. If you are an experienced runner aiming for a time goal, start out at that goal pace – banking time never works in a race. Save the sprint for the end of the race – not the start. Unless the weather is unseasonably warm, you can expect to be cold at the start of your Turkey Trot (depending on where you live). It might even be snowing or raining for some of you! While some runners may still run in shorts, you want to dress appropriately for the cold weather: gloves, hat, warm socks, long sleeve shirt or jacket, and even running tights if it is very cold. Avoid cotton and opt for wicking layers. However, don’t bundle up! You won’t feel as cold once you start running, so you don’t need to wear a parka or several layers. Dress as if it is 10-15 degrees warmer (Fahrenheit) than it actually is. If you are worried about being cold before the race, wear some extra layers – most races have a gear check or donate throwaway items to a local clothing resale or shelter. If running with family or friends, do not run more than two abreast. You do not want to block other runners who may be trying to pass. If you are walking or doing run/walk intervals, pull over to the right to let other runners pass you. Do not suddenly stop or slow down without giving notice to other runners and getting out of the way. Keep music low enough to hear other runners or volunteers. Line up appropriately at the start line. If it is your first race or you plan on walking, line up further back. It doesn’t matter if you are a serious runner focused on a PR, or heading out to run with family and friends before the feasting begins, this isn’t Boston Marathon qualifying…take time to have a little fun and set the stage for a thankful day. Wear a costume or a fun shirt. Get your family to join you. Thanksgiving is about togetherness and about being thankful. As you run or walk, be mindful of all the things you are thankful for including the ability to live a healthy active lifestyle. Be thankful you are living Wholesome to the Core and will soon be sitting down with family and friends to enjoy a meal together.